Variable Linanthus - Leptosiphon parviflorus, is an annual herb that is native only to California. 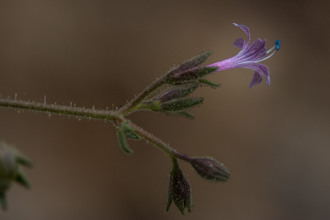 This plant is a member of the Phlox (Polemoniaceae) family. 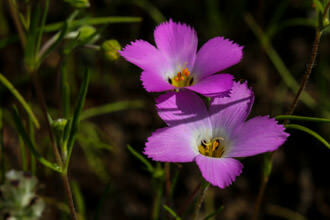 One can find this plant growing in small patches from sea level to 1,200 meters (3,900 ft) elevation. Common in many types of habitats, including chaparral and oak woodlands. This little flower (around a half inch in diameter) comes in several colors: white, pink, purple, magenta, lavender and yellow. 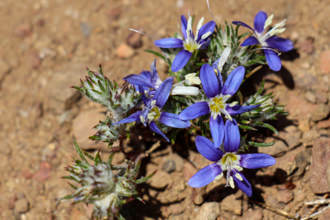 As the plant's common name suggests, the plant is variable in appearance. Stems may be just a few centimeters long or up to 25 centimeters. Leaves: divided into several lobes, often linear in shape, and 1 to 2.5 centimeters long. Reddish green palmately (palm - like your hand) lobed colored leaves appear like they are in a whorl but close examination reveals that they are in pairs of opposite pairs. Growing in dense, spiky clusters, the number of flowers is quite variable. With so much variability, what do members of the species have in common? Plants I saw had a Corolla, yellow at the bottom and white at the top from which six stamens and three stigmas protruded. 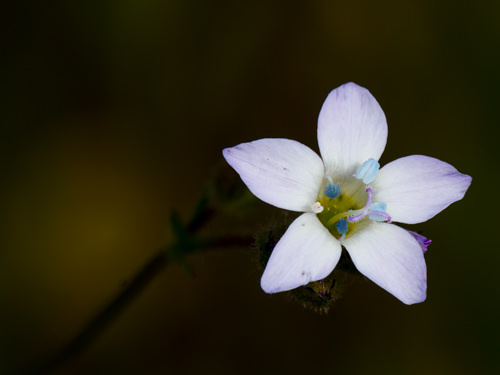 Since these are such small flowers a hand lens comes in handy to observe this delicate beauty. The flowers are in small umbels (they look like umbrellas after the wind has blown them in the wrong direction!) with a little tuft of bracts. I found these plants in soil that had lots of sand - just off the trail along a season dependent flowing stream. 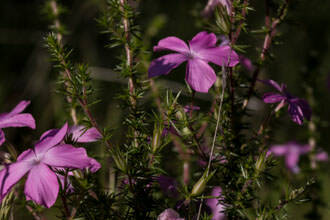 The flowers were tiny but the way they reflected light was fantastic. If you see these flowers and they have not unfurled come back after 10 AM. These flowers lay low to the ground and required that I get down on my belly to photograph and observe them. 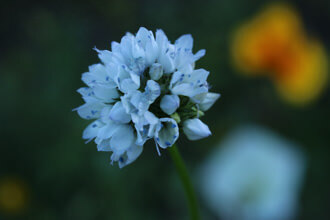 The following plant name information was found on calflora.net a wonderful site for native plant information. Name Origin: Leptosi'phon: from the Greek leptos, "slender," and siphon, "a tube"
parviflor'a/parviflor'um/parviflor'us: from the Greek parvus, "small," and flora, "flower," hence "small-flowered"
Last modified: March 31 2017 21:26:36. The Santa Monica Mountains Trails Council, a volunteer nonprofit organization, is dedicated to establishing, preserving and maintaining the public trail system throughout the Santa Monica Mountains and adjacent areas through education, advocacy and partnership with public and private sectors.